All mains gluten free without chips and bread. Traditional garlic chicken marinated with mixed mediterranean herbs served with a tomato and cucumber salad, pita bread and traditional tzatziki. char grilled lamb pieces served with a tomato and cucumber salad, pita bread and traditional tzatziki. Sautéed garlic prawns served with rice and wood fire bread. 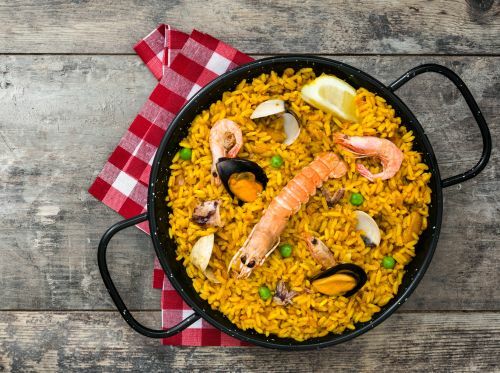 Traditional spanish rice cooked with mussels, calamari, prawns, baby octopus king prawn served in a pan. Croquettes with cod fish and coriander served with aioli and lemon. Drizzled with chilli and olive oil. Aregentinean sausage served with napolitana sauce, rocket and wood fire bread. Battered cauliflower deep fried and served with aioli. Grilled baby octopus with capsicum, onions and shallots. Homemade chorizo pan fried with onions and capsicum. Succulent pork skewers served with a spicy chimichurri dressing. Cucumber, tomato, sumac and onion tossed with crunchy Arabic croutons with a tangy pomegranate dressing. Homemade sticky date pudding served with caramel sauce. Homemade with raspberry coulis and Persian pistachio fairy floss. With melted chocolate dipping sauce.